Gene Ammons (ts), Albert Ammons (p), Ike Perkins (g), Israel Crosby (b), Al Burroughs (ds). The tune entitled “Hiroshima” was recorded on August 6, 1947 – second anniversary of Hiroshima bombing. On the other hand, this tune is the retitling of “Nagasaki”, a typical Tin Pan Alley song and Jazz standard tune composed way back in 1928 by Harry Warren and Mort Dixon. Ammons recorded “Nagasaki” in 1936, and the rendition by the sextet is the definite classic. Albert Ammons (p), Ike Perkins (g), Israel Crosby (b), Al Burroughs (ds). The performances of “Nagasaki” (1936) and “Hiroshima” (1947) themselves by Albert Ammons are simply awesome. Ammons’ Boogie Woogie piano is rolling and romping, “Hiroshima” even featuring magnificent tenor improvisasion by Gene Ammons (Albert’s son). When the tune “Nagasaki” was composed in 1928, the title itself meant almost nothing – it was just one of the “exotic” novelty songs, and the lyrics only have the vaguest relation to the port city in Kyushu, the southwest island among the main four. Then during the 1930s and early 1940s it became one of the jam classics. 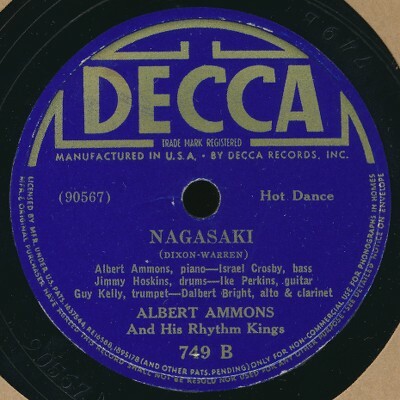 And after the WWII, Albert Ammons recorded the tune again with his son Gene for Mercury Records on August 6, 1947, retitling it to “Hiroshima”, two years after the Hiroshima bombing. I don’t have any offensive emotion to these musicians and this weird, peculiar story. Nevertheless, as a Japanese, I always have very strange feeling when listening to these tunes, no matter what the performances are really great. Also, “Hiroshima” and “Nagasaki” always come in my mind in August every year somehow. and tagged 1936, 1947, Albert Ammons, Decca, Gene Ammons, Hiroshima, Mercury, Nagasaki.